It has been revealed that certain Non Governmental Organizations conduct press conferences, workshops, training for journalists, and dissemination of press releases which is beyond their mandate. We reiterate that all Non Governmental Organizations should prevent from such unauthorized activities with immediate effect. The letter comes as no surprise. It is, however, rather funny. It has been revealed that certain Non-Governmental Organisations have members who are breathing and still moving. We hereby call upon all of them to cease from such unauthorized activities with immediate effect. This Ministry sees Sri Lanka as a country of the dead. Such is the mentality of the so-called Ministry of Defence and the pawns acting on behalf of the Secretary to this Ministry. That the Sri Lankan people should not think, should not speak, should not even dream of expressing any view critical of the government, is the ideal in the imagination of the Secretary to the Ministry of Defence. The way this Ministry is handling affairs in Sri Lanka, there is nothing unconscionable about shedding the blood of anyone who dares to think or oppose the government in any manner. Anyone who takes the trouble to make a list of those whose blood has been shed in recent years, for no other reason than expressing their protest against government policies, would know that this Ministry means business when it issues such letters. 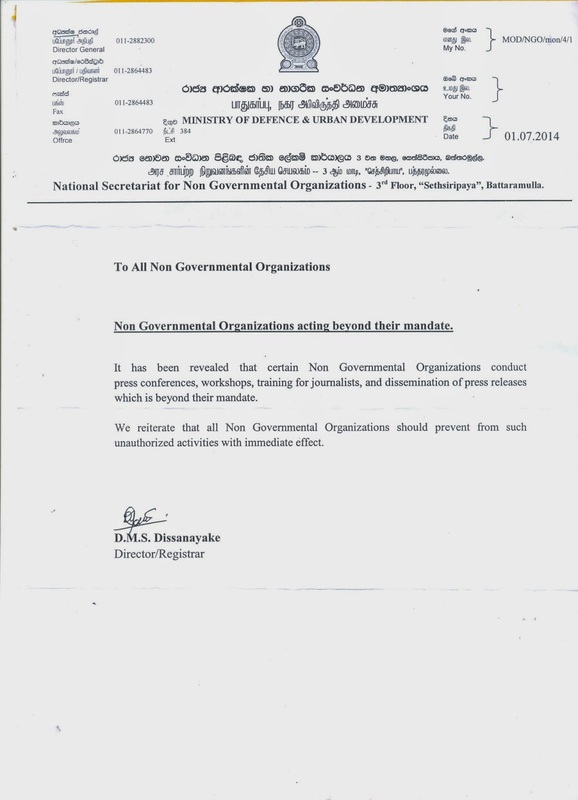 What the Ministry of Defence is trying to tell NGOs that dare to express themselves –by conducting conferences, workshops, training of journalists, and disseminating press releases – is not only that the gates of prison are open for them, but something more: that they face dangers similar to what many other Sri Lankans have faced already. Holding a press conference, conducting a workshop, training journalists (or anybody else for that matter), and disseminating press releases are actions available by right to any citizen of Sri Lanka. Members of non-governmental organisations have the same rights as anybody else. The Ministry of Defence may retort by stating that no such rights exist for anybody save those undertaking such activities on behalf of the government. The message of their vision – that of a country where people enjoy rights only in their dreams – is what the Ministry of Defence has been trying hard communicate for a while now. The problem for the Ministry is that there are still those who believe in such dreams, those who struggle in their own ways to turn this dream into reality, and those who still wish to call a spade a spade, i.e. a dictatorship a dictatorship. The Director that signed the letter in question may want to say that he has done something kind by sending a warning before going on to do something worse. Every corner of Sri Lanka reverberates with such dark warnings. The privilege of organizing public meetings is a privilege that belongs only to those organisations that have the patronage of the Ministry of Defence. Organizations patronized so even have the privilege of using such meetings to provoke public violence. It is for organisations such as the Bodu Bala Sena (BBS) – where the leading monk can yell out calls for vengeance against those he views as opponents – that the privilege of free speech and assembly is granted by this Ministry. There was once a time when one could ask the Director who signed this letter what law gave him the authorisation to issue it. It was possible to call him before a court of law to answer how he had the impertinence to issue such an order. Alas, such possibilities, of asserting the authority of the law against the perversity of the government, are luxuries no longer available for Sri Lankans. When a mad dog circles the neighbourhood, everyone has a reasonable fear of catching rabies. When authorities in charge of law enforcement agencies lose their sanity, every citizen has a reasonable fear of the arbitrary use of violence. When a government ministry goes to the extent of issuing such a letter, it is a warning to one and all about how deep the government has sunk into disorder. Now is the time for all forces opposing the government to call for an end to such arbitrariness, to this insanity.